New hotel openings in North America include a pair of Starwood brands at Boston’s convention center; a Four Points by Sheraton in New York’s financial district; a Hilton convention hotel in West Palm Beach, Florida; the conversion of an historic Cleveland building into a Kimpton; and a new Renaissance from Marriott in downtown Montreal. Starwood has cut the ribbon on a pair of new hotels in Boston’s Seaport District, on D Street just across from the Boston Convention & Exhibition Center. 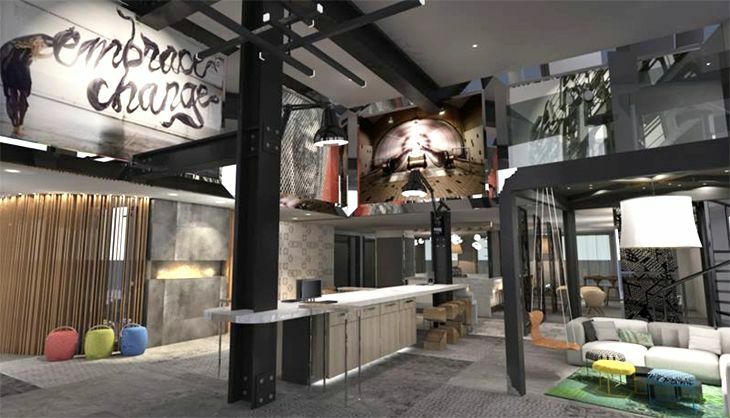 The dual-branded project includes the 330-room Aloft Boston Seaport and the 180-room Element Boston Seaport. 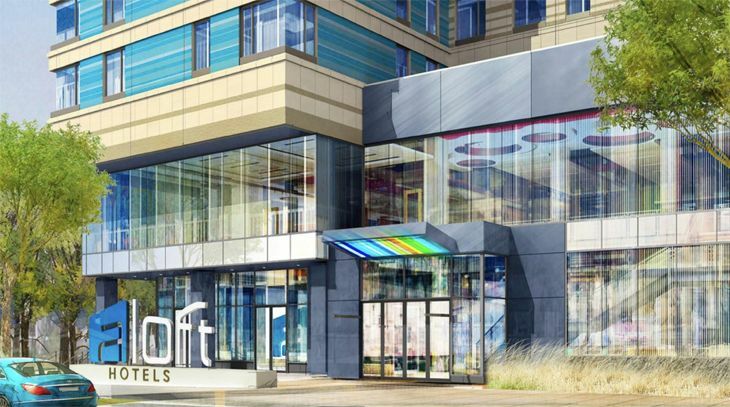 In addition to 10,000 square feet of meeting space and free Wi-Fi hotel-wide, the Aloft offers the usual features of that brand, like a Re:fuel grab-and-go market, a 24-hour fitness center, the signature W XYZ Bar and a swimming pool. The new Element has studio-style guest accommodations with full kitchens, 1,000 square feet of meeting space, an indoor salt-water pool and a fitness center. The two hotels, less than three miles from the airport, are separated by a new driveway off D Street that provides access to the front entrances of both properties. Rates start at $235 at the Aloft and $313 at the Element. The newest hotel in New York City’s Financial District is Starwood’s Four Points by Sheraton New York Downtown, located at 6 Platt Street – a short walk from the New York Stock Exchange. 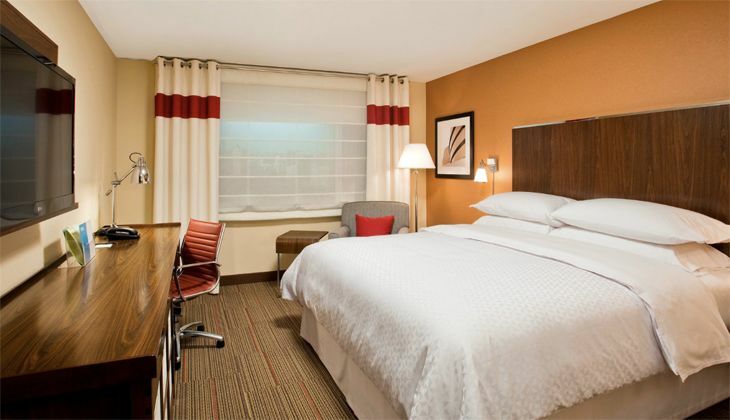 The 261-room Four Points offers free Wi-Fi, 2,000 square feet of meeting space, a 24-hour fitness center, a business center, a full-service restaurant called the Ketch Brewhouse, and a rooftop lounge serving up local beers and barbecue. Nightly Rates start at $260. Florida’s Palm Beach County Convention Center has a newly opened hotel connected to it by an enclosed walkway: The Hilton West Palm Beach. 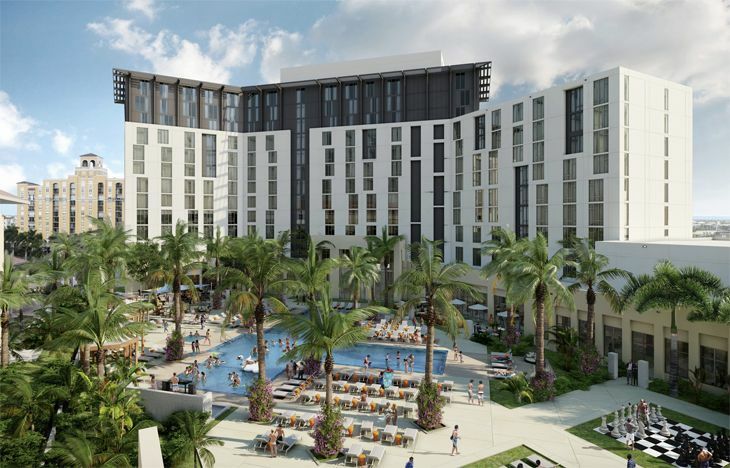 It’s a 400-room (and 43 suites), 12-story convention hotel at 600 Okeechobee Boulevard with more than 24,000 square feet of function space, including a 5,800 square foot ballroom. Rates start at $199. The new Hilton has “an in-house panel of experts” who put together team-building exercises and games for corporate groups. Its restaurant, called Manor, serves up farm-to-table American cuisine under Matthew Byrne, owner of the Palm Beach restaurant called Kitchen and former chef for Tiger Woods. It also has a lobby bar and a marketplace with locally sourced food and gifts. 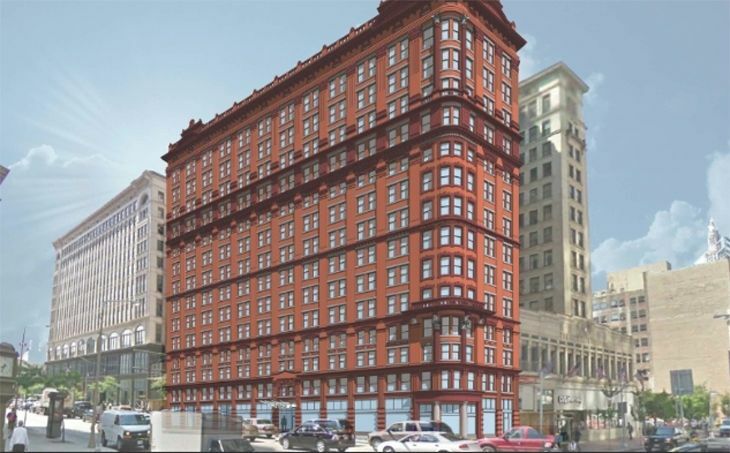 The historic Schofield Building in downtown Cleveland at 2000 East Ninth Street will get a new life next month when Kimpton Hotels opens it as The Schofield Hotel. Kimpton kept the building’s original terra cotta façade, but spent $50 million converting the inside into 122 hotel rooms and 52 apartments. The rooms are decorated with reminders of Cleveland’s industrial history, and Karma Rewards members get free Wi-Fi. In April, the hotel will open a 120-seat restaurant and bar called Parker’s Downtown. Kimpton’s Schofield Hotel will offer guests free use of bicycles and yoga mats as well as a nightly wine hour, occasional craft beer nights and “a loaner guitar program.” Rates start at $150 (although when we checked the availability calendar, there wasn’t any until May). In the heart of downtown Montreal, at the corner of Robert-Bourassa Boulevard and Cathcart Street, Marriott has cut the ribbon on the new Renaissance Montreal. The 142-room Renaissance has a Pan-Asian restaurant called East, as well as a 12th-floor rooftop terrace (covered and heated) with a bar, a bistro kitchen, and a plunge pool. The lobby is decorated y a local street artist, and serves up live DJ music and cocktails. 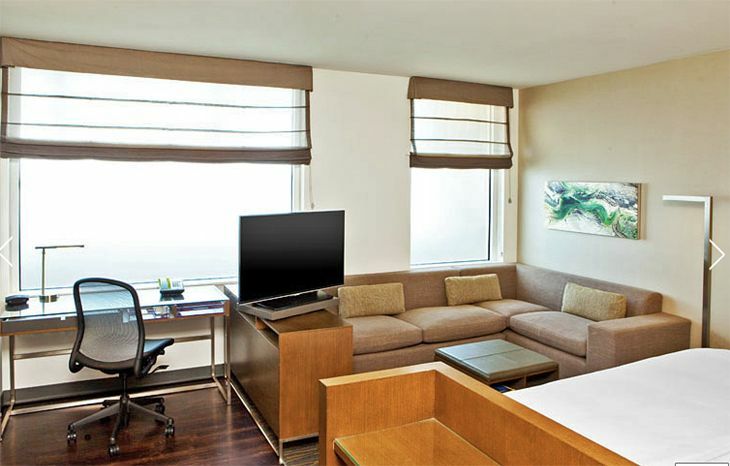 The new Renaissance has a business center, a fitness center, high-speed Wi-Fi and a Nespresso machine in every room. 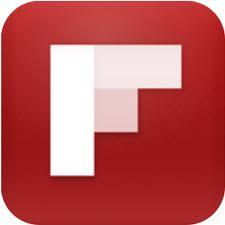 Introductory rates start at $199 (Canadian) through April 23.